(Nanowerk News) Precision positioning systems industry leader PI (Physik Instrumente) has released an elevated version of its ironless linear motor stage, LMS-180, which is well-suited for precision automation applications in industry and research that require highly accurate linear motion over long travel with high load capacity. 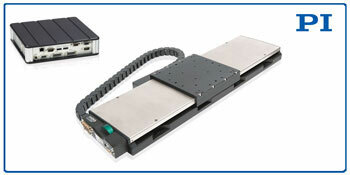 NEW Linear Motor, Direct Drive Precision Positioning Stage, LMS-180, shown with SMC Hydra Motion Controller. The LMS-180 linear stage family is available with five travel ranges from 6” (155mm) to 20” (508mm). Equipped with an ironless electromagnetic linear motor, the LMS-180 delivers smooth motion with 15 nanometers resolution and repeatability down to 0.05 microns. When driven with the SMC Hydra closed-loop motion controller, a maximum velocity of 19.7”/second (500mm/sec) is reached. Highly accurate position feedback is provided by an integrated direct-measuring incremental linear encoder with sine/cosine output. Recirculating ball bearings provide high-load capacity of 250N (56lbs) and durability at demanding repetitive cycle rates with high speeds. Ironless, non-cogging linear motors provide very smooth motion, and a high dynamic velocity range along with rapid acceleration. They are ideal for applications where high resolution and extremely constant velocity is required, such as in optics inspection, metrology, photonics, interferometry, and semiconductor test equipment. The frictionless, zero-wear motor drives are also popular in fast automation applications, where reliability and maximum uptime are crucial. The LMS-180 stage is also available in a modified version (LS-180) with a ballscrew drive and rotary stepper and servo motor options. The LS-180 stage provides even higher load capacity of 1,000N (224lbs), as well as higher push/pull forces. It is mounting compatible to the LMS-180 for easy assembly of multi-axis systems.